In 1987, Michael Roberts published a groundbreaking discovery that changed the world of reproductive biology research. 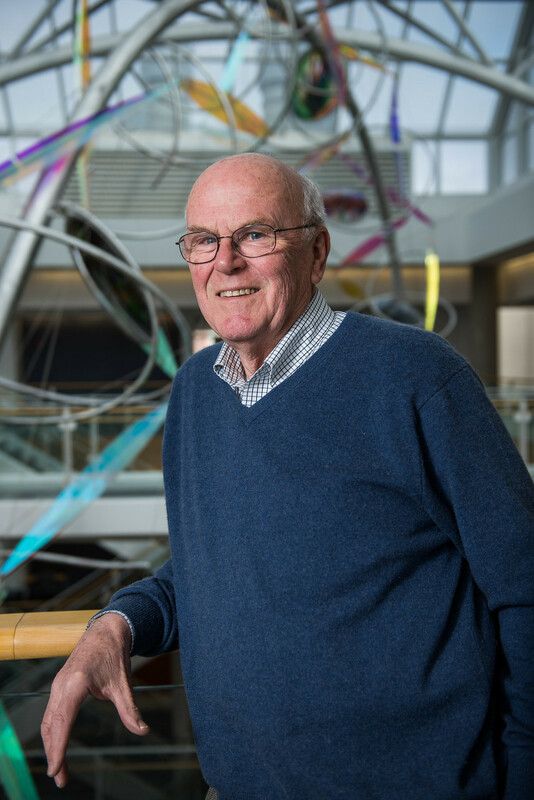 Roberts and members of his lab discovered that a type of protein, an interferon, impacted how the bodies of animals such as sheep, goats and cows, recognized an embryo early in pregnancy. Previously thought to only be a part of a cell’s immune system response, this new signaling role changed the field. In honor of his lab’s groundbreaking discovery, Roberts recently curated a section of six reviews examining the history of the discovery and current research that has built on it for the November issue of the journal Reproduction. The discovery revealed an unknown in the reproductive systems of the ruminant family of animals, including sheep, goats, cows and deer. When an embryo first begins developing, before it’s placenta even attaches to the uterus, it releases interferons. Only present for a few days, these proteins signal to the mother’s body that the embryo is there. It triggers the response that keeps the animal from going into heat, basically shifting the animal’s hormones from breeding mode to pregnancy mode. If the embryo doesn’t release interferons, the mother miscarries. Placing interferons in sheep that were not pregnant made the animals pseudopregnant, a false pregnancy in which no fetus is present. Scientists at the time knew something made the mother’s body recognize the embryo, but they were not sure what. The discovery of interferon-tau was a mystery solved. That this ‘something’ was an interferon was also a surprise. Before Roberts and his co-discoverer, Fuller Bazer, found interferon-tau, researchers thought that interferons only function was in the immune system. Other interferons help the body recover from viral infections, like cold and influenza, Roberts said. The discovery that the protein also played a role in pregnancy caused some hubbub. It even caught the attention of The New York Times, Roberts said. The discovery of interferon-tau created opportunities for more research in how ruminant’s unique reproductive systems evolved. Other studies focused on using interferon-tau to improve livestock fertility, but ultimately this interest fizzled out as researchers found fertility treatments for cows were cost-ineffective for producers and unappealing to the public. The discovery of interferon-tau earned Roberts and his co-discoverer the Wolf Prize in agriculture in 2002. Some consider the prize an equivalent to the Nobel Prize since the Nobel prize does not regularly honor agriculturalists. After the discovery of interferon tau, Roberts found another protein that impacts pregnancy, which formed the basis of a pregnancy test for cows. Roberts said it’s now a multi-million dollar product in the cattle industry. Today, Roberts’ lab has moved to other developmental research. He started studying human placentas. His work focuses on preeclampsia, a condition which impacts 5-10 percent of all pregnancies and is caused by the placenta. Roberts’s lab has also developed new lines of pluripotent pig stem cells which are helping scientists learn how to regenerate eye and heart tissue. At age 77, he is still funded and active.